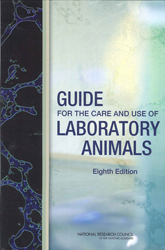 Guide For The Care & Use Of Laboratory Animals - ubiq bookshop: the best place to buy books! A respected resource for decades, the Guide for the Care and Use of Laboratory Animals has been updated by a committee of experts, taking into consideration input from the scientific and laboratory animal communities and the public at large. The Guide incorporates new scientific information on common laboratory animals, including aquatic species, and includes extensive references. It is organized around major components of animal use: Key concepts of animal care and use. The Guide sets the framework for the humane care and use of laboratory animals. Animal care and use program. The Guide discusses the concept of a broad Program of Animal Care and Use, including roles and responsibilities of the Institutional Official, Attending Veterinarian and the Institutional Animal Care and Use Committee. Animal environment, husbandry, and management. A chapter on this topic is now divided into sections on terrestrial and aquatic animals and provides recommendations for housing and environment, husbandry, behavioral and population management, and more. Veterinary care. The Guide discusses veterinary care and the responsibilities of the Attending Veterinarian. It includes recommendations on animal procurement and transportation, preventive medicine (including animal biosecurity), and clinical care and management. The Guide addresses distress and pain recognition and relief, and issues surrounding euthanasia. Physical plant. The Guide identifies design issues, providing construction guidelines for functional areas; considerations such as drainage, vibration and noise control, and environmental monitoring; and specialized facilities for animal housing and research needs. The Guide for the Care and Use of Laboratory Animals provides a framework for the judgments required in the management of animal facilities. This updated and expanded resource of proven value will be important to scientists and researchers, veterinarians, animal care personnel, facilities managers, institutional administrators, policy makers involved in research issues, and animal welfare advocates. Featured in the January 2011 Mostly Medical newsletter.